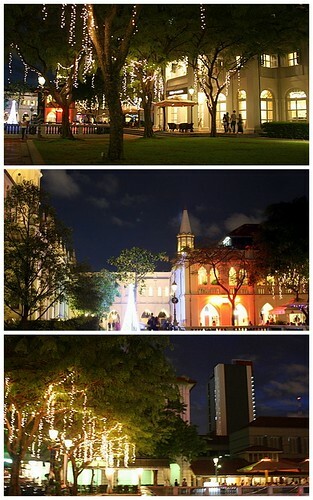 Chijmes is a former convent converted into a beautiful dining venue that houses many beautiful restaurants, cafes and bars. We were there during Christmas Eve last year. 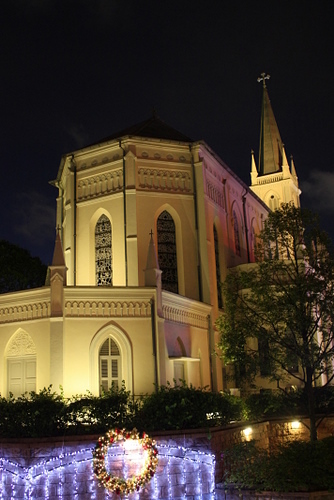 The management did a good job restoring and reviving CHIJMES Hall, an old chapel with fine gothic architecture. Take a stroll along the beautiful lawn space and courtyard with your loved one. So romantic! 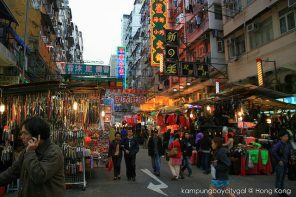 To get here, take the MRT to City Hall Station (EW13/NS25). Walk along Stamford Road and turn right at the junction of Stamford Road and Victoria Street. 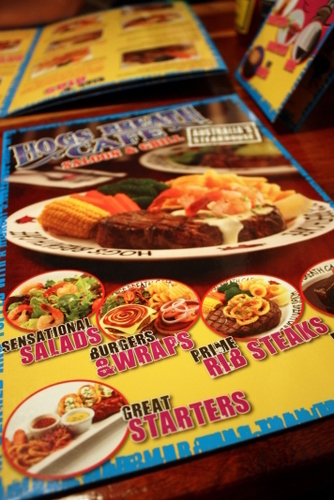 Since the nicer (read: expensive) restaurants like Lei Garden or Capella are way out of our budget, we chose Hogs Breath Cafe, an Australian chain of steak house restaurants that exudes a more casual and laid back ambiance. 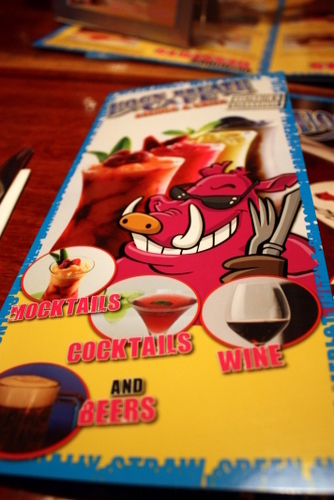 Hogs were seen everywhere – as decor pieces or printed in the menu but this is NOT the place for some babi-licious dishes. In fact, one should just stick to the steaks because they take pride in their best quality Australian Prime Rib that has more fat than traditional grilled steaks. It undergoes a slow cooking process for up to 18 hours, then finish with high temperature searing on the char grill to seal in the meat juices. some chicken roll thingy – don’t bother. 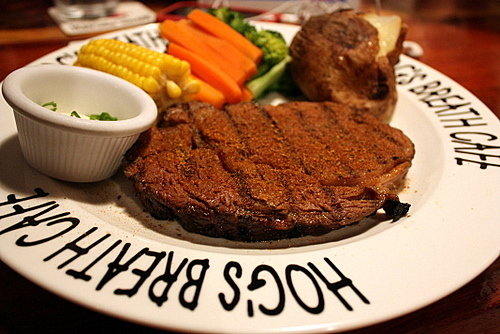 The steak was done just right – truly tender and mouth watering juicy. The 18 hour slow-cooked process works apparently!. 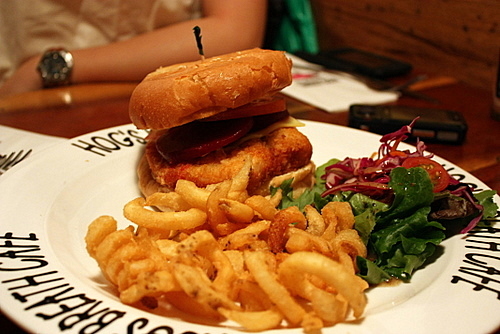 The chicken burger was mediocre, but the curly fries aka hog’s tail fries were really good! 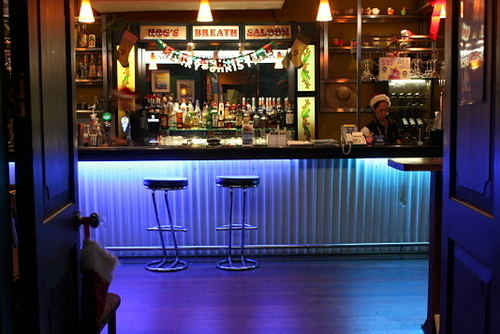 All in all, Hogs Breath Cafe is the place to go for some decent steaks, and nothing else. 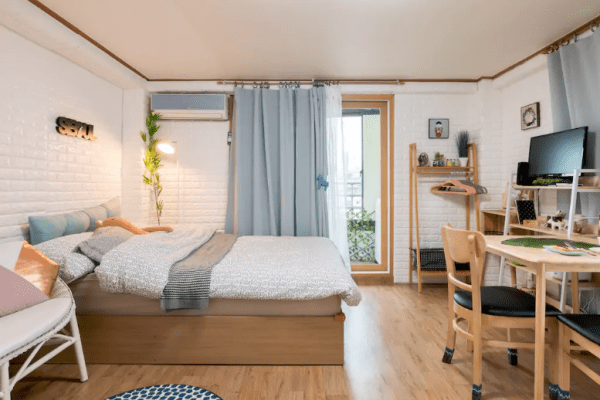 Be ready to pay about SGD 35 – 50 per person. 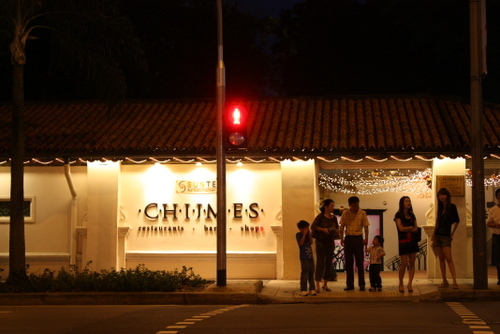 I can’t wait to explore the other restaurants in Chijmes the next time I’m in Singapore! 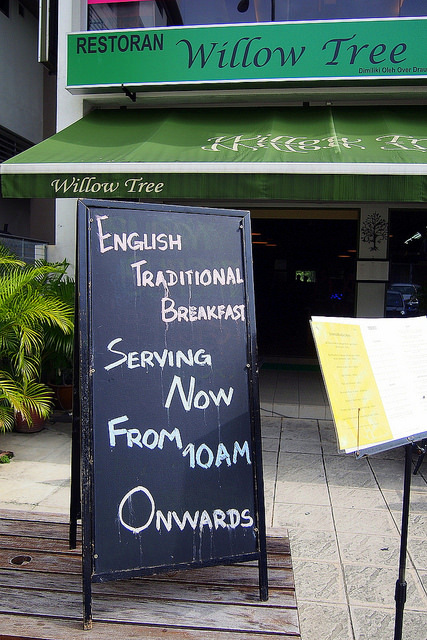 .-= TummyRumble´s last blog ..Restaurant Overseas – Plaza Armada- beside Armada Hotel- Section52- Petaling Jaya =-. KBCG, you got a lot of nice pictures as usual, keep it up ya 😀 jia you jia you! 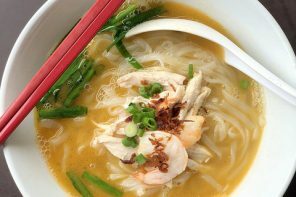 .-= wyyv´s last blog ..Sweet Hut – Kuchai Dynasty Central =-. .-= KY´s last blog ..Restaurant Golden Dragon at Kuala Terengganu =-. .-= thule aka leo´s last blog ..KTZ Food – SS2 PJ =-. 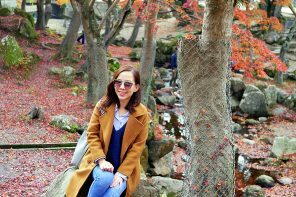 .-= minchow´s last blog ..The Return of Rationale- Saifon Thai =-. theres no pork ribs? i remember having this back in adelaide. 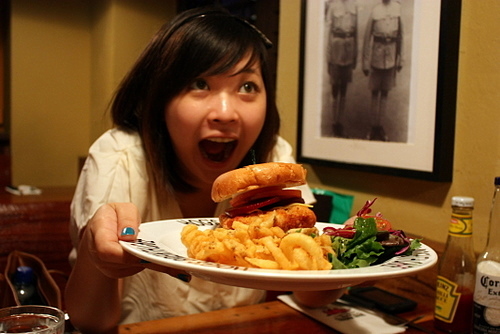 huge portions to satisfy any form of hunger! .-= lotsofcravings´s last blog ..My new tag line- 365 days of constant cravings =-. OMG~~ this place is so nice!!! It’s quite romantic if you go there with your lovely partner. 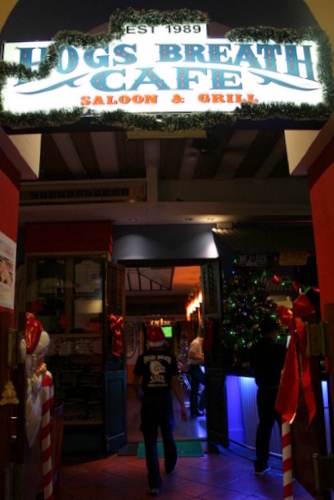 My wife and I were at CHIJMES Christmas 2009 at nearby Bobby’s. Try their babyback ribs. Yeah we passed by Hog’s but our focus is Bobby’s. 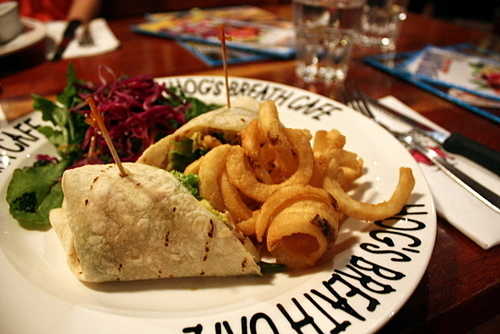 I think Hogs Breath is quite popular in OZ too…. .-= JD´s last blog ..They grew so fast…Diary of an Otto-san =-. I would have imagined the babi-licious fares to take centrestage though. Especially from that pink piggy on the menu. .-= J2Kfm´s last blog ..Of “Er-Hu”- Prawn Crackers -amp the Crabs that Never Came =-. .-= shuigao´s last blog ..Blackmore Wagyu Special at Prime Le Meridien KL =-.